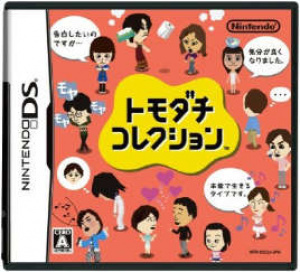 Could this be Nintendo's latest DS hit in Japan? It may have taken awhile to be released, but Nintendo's highly-anticipated Tomodachi Collection had a great first day opening in Japan. Out of the 76,000 units that were shipped, 38,000 were sold on the game's first day on the market, which equates to a 50% sell-through rate. That's pretty impressive seeing as the top game last week sold only 38,000 units in a week. Media-Create will release its sales chart dated June 15-21 later this week. If all goes well, Tamodachi Collection should take the top spot, followed closely by Infinite Space (DS, Sega), Kingdom Hearts: 358/2 Days (DS, Square-Enix), Fate/Unlimited Codes Portable (PSP, Capcom), and Sloane and MacHale's Mysterious Story (DS, Level-5). OK, is Infinite Space relevant to Tomodachi, is it the Japanese name, or is it something you should fix? Havent heard anything about this one. haha, its a Mii game, but i heard its not a real game-game, but an extension of Mii related things. I think he didn't have pics for Tomodachi Collection, and wanted to fill up space. The Infinite Space pics came up because it was listed as a related game. It's not connected with the story game, but it was mentioned in the article and I assume NLife doesn't have a listing for the actual game yet. That's nice, but I still don't know what this game is about. What kind of a news is that? Most people here obviously donÄt know anything about the game so you should enlighten as to why we should care about the sales of this specific game. It is worth noting Tomodachi Collection is one of the games you can download a demo of at the McDonalds stores (remember that dela last week?) so that will be giving it a marketing boost. From what the gonintendo podcast said about the game it has a few interewsting features (including voice synthesis allowing the Miis to talk). Yeah, it's about taking care of Miis. Granting them their wishes, let them date other Miis, get married or just befriend someone. It's really a fun game cos you can create Mii with images of your friends or ppl you like (celebrities included, lol)... and you can observe their interaction etc. If you set the Mii's personality right, they will end up just like how they are in real life! !